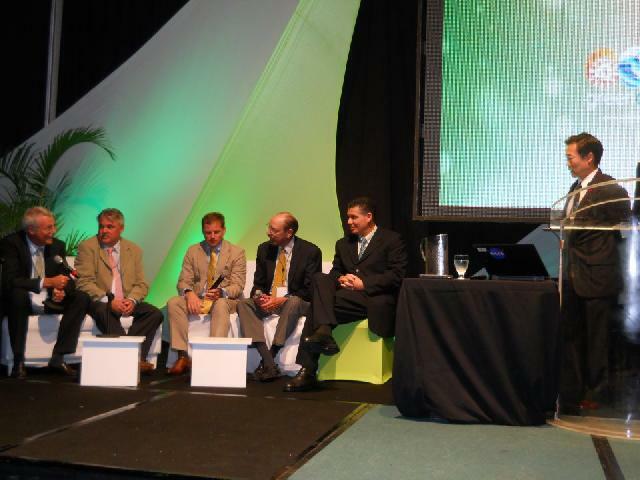 I attended the first Green Aruba Conference in 2010, and spoke about the new Solar Arrays on Hubble (SA-3) along with the other replacement hardware elements I have worked over the years. I must have done something right because the organizers decided to name me chairman of the 2011 event. Tisa LaSorte and I were co-hosts of the GA II conference. 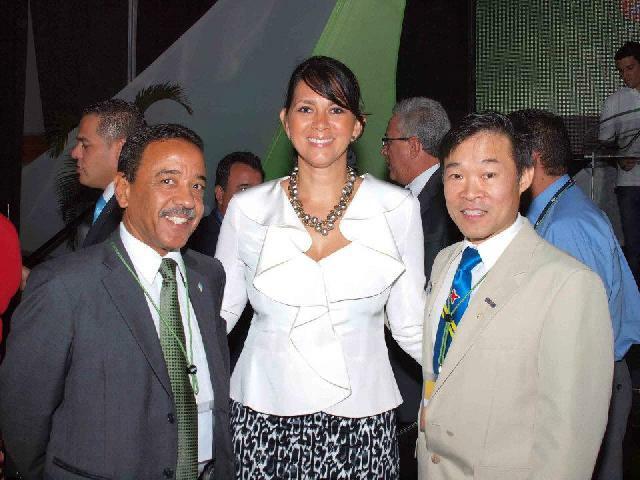 It had been the vision of the Prime Minister of Aruba, Mr. Mike Eman, and his government to build a third pillar of the Aruban economy based on renewable energy. This in addition to petroleum and tourism which for decades have been our main economic sources. Aruba's geographic location between Europe and South America, and our abundant sun and wind resources provide a good opportunity to start a new direction. 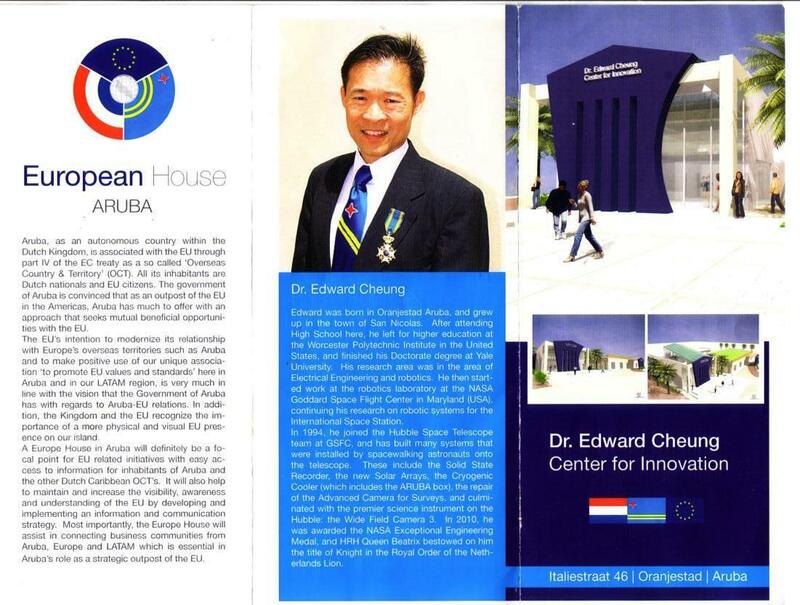 Their vision was to have Aruba function as a gateway between the two continents in this area. 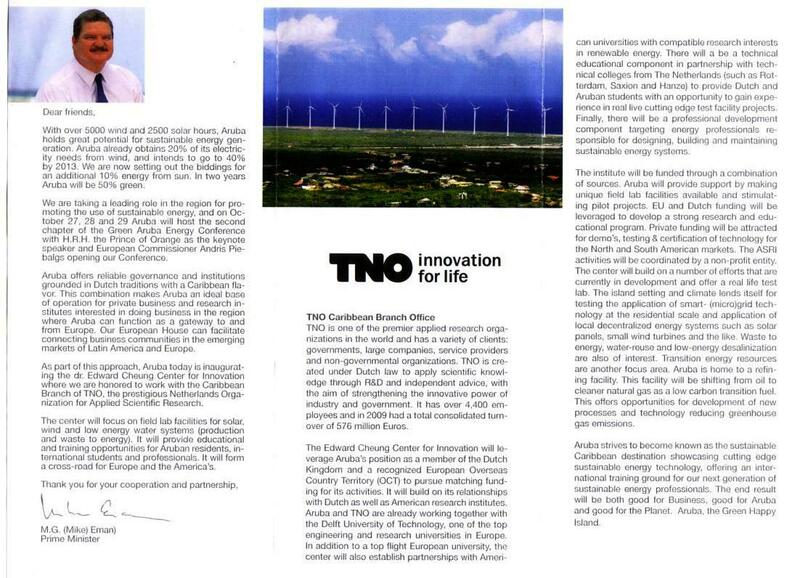 To provide intellectual know-how, the Dutch applied renewable energy research organization TNO was contacted, and they decided to establish a branch office in Aruba. 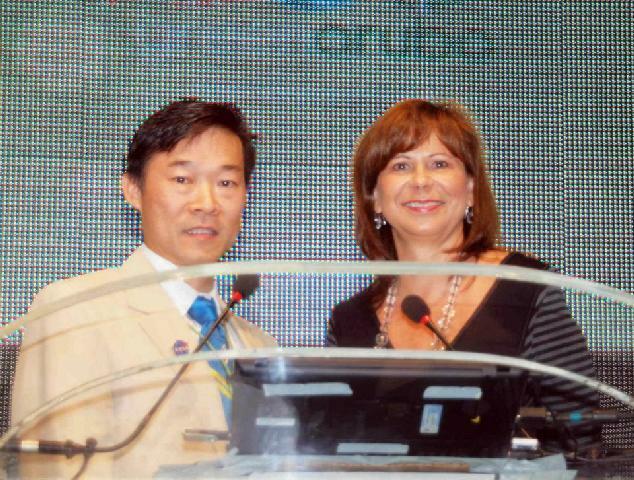 The agreement between TNO and Aruba would be signed at the GA II conference. 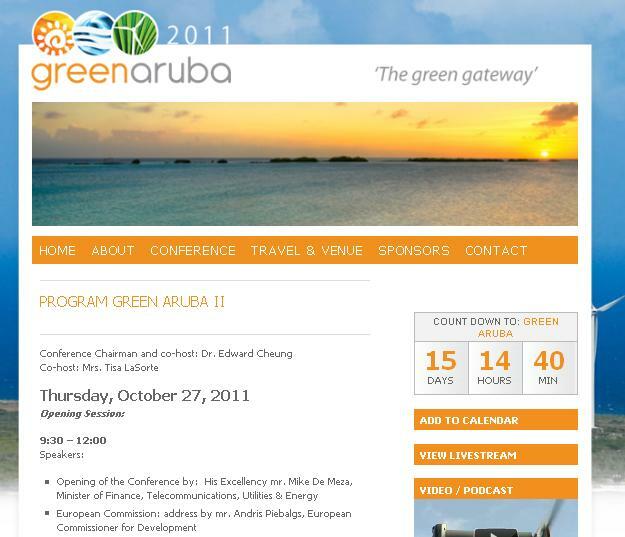 A few days before traveling to Aruba for the conference, on Sunday October 23, 2011, the Prime Minister of Aruba gave me a call. As the call proceeded, I thought he was going to invite me to the opening of the TNO branch. I was quite pleased at the thought of this. However, it turns out that he was asking me if it was acceptable to name the building in my honor. I was of course completely amazed and humbled and accepted. Press conference on 10/24/2011 announcing the naming of the Center. I Skyped into the press conference to announce this plan the next day. 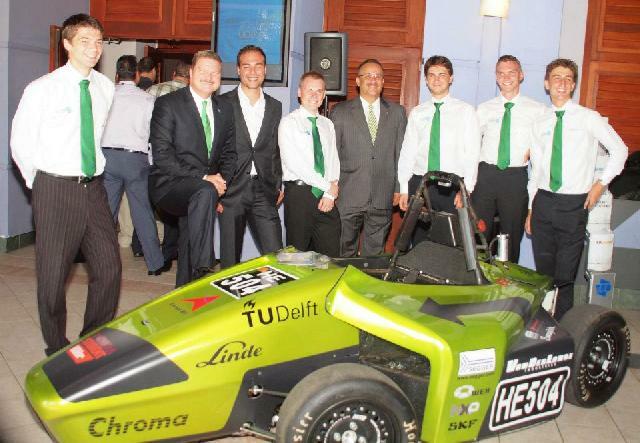 Not only was the PM present, but also the Deputy PM (Mike de Mesa), and the Minister of Environment (Benny Sievinger). I chose the GSSCC as the backdrop, and the folks in Aruba could see a live image from the ISS in the background. E Informante (short article in Papiamento paper). Archived. Diario (Papiamento paper with largest circulation). Archived. Awe Mainta (front page in Papiamento paper). Archived page 1, page 2. 24ora.com (online Papiamento paper). Archived. Morning news (English paper). Archived page 1. Page 2. Aruba Herald (online English). Archived. ATV Video segment (NBC Aruba). 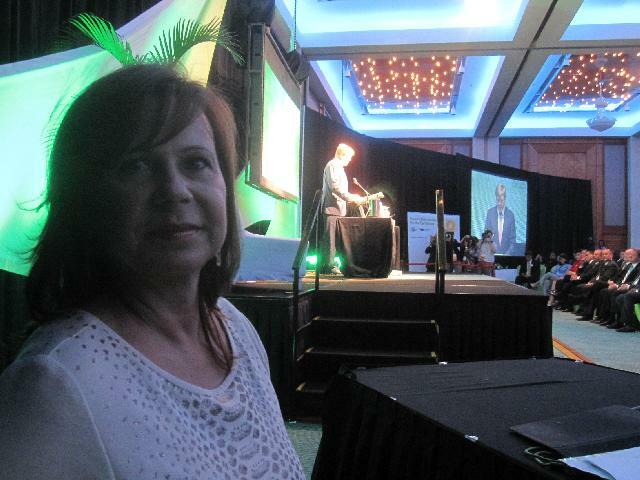 I traveled to Aruba on 10/26, and opened the conference the next day. Agnes and the kids were unable to travel with me because Stephanie had her first Parent's week at CMU. Excerpt of the opening speech by the Prime Minister of Aruba Mike Eman. Tisa LaSorte was my co-host for the conference. Next photos by Klein. Upon introducing myself, I received a surprise standing ovation. With Parliamentarian Herde, and Minister Winklaar. audience. It produced some lively discussions after the talks. Morning news (English paper). Archived. 24ora.com (online Papiamento article). Archived. Awe Mainta (online Papiamento paper). Archived. Morning News concluding article. Archived. 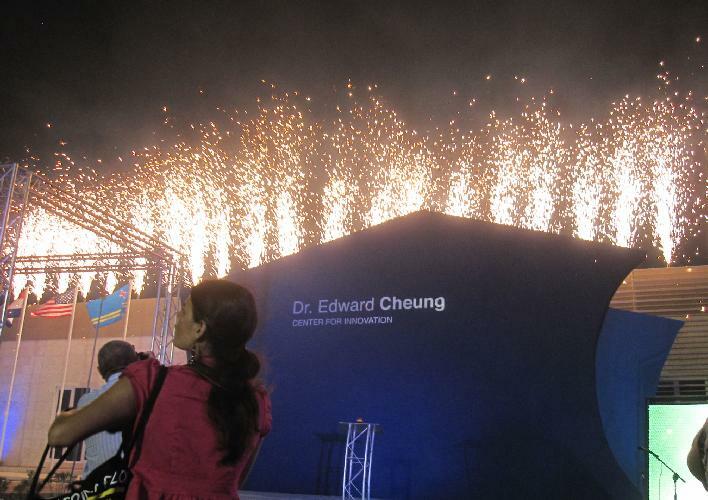 At the conclusion of the first day, we moved the attendees to the Center for Innovation, and performed the official opening. troupe. Note the cover over the name of the building. traditional Aruban. It represents the bridging of cultures. Here we stand for the playing of the national anthems. In the image above, the person are from left to right, starting with person with blue tie: Melvin Tromp (parliament), Lorna Verlack (parliament), Mom, Andy Lee (parliament), me, Donny Rasmijn (parliament - w/red tie), Dutch Minister Piet Donner, Arthur Dowers (Minister of Justice and Education), Paul Croes (president of parliament), Doina Eman (wife of PM), Mike Eman (Prime Minister), Andris Pibalgs (EU Energy Commisioner), Mike de Meza (Minister of Energy and Finance), and others (photo Poets). Mom (partly hidden) was invited to pull the cover off the name. She was so happy to have the honor. fireworks erupted from the roof line !! Marinus Wegereef was the driving force behind all the decorations. 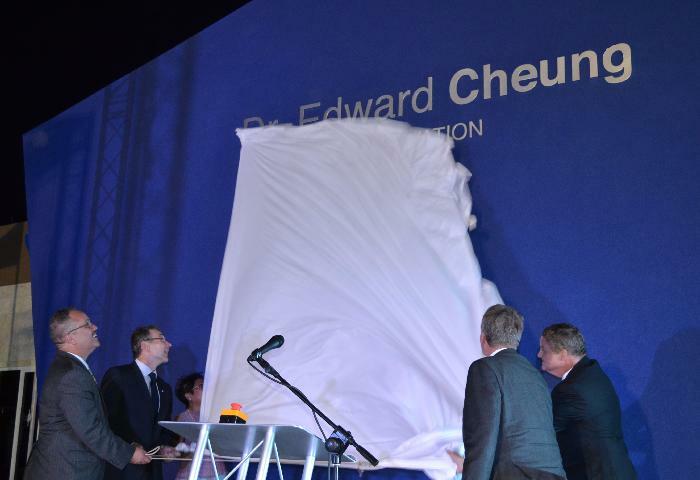 After the unveiling of the name, we posed for photos. on this day the tie that Agnes made me for my Knighting ceremony. this long and eventful day. 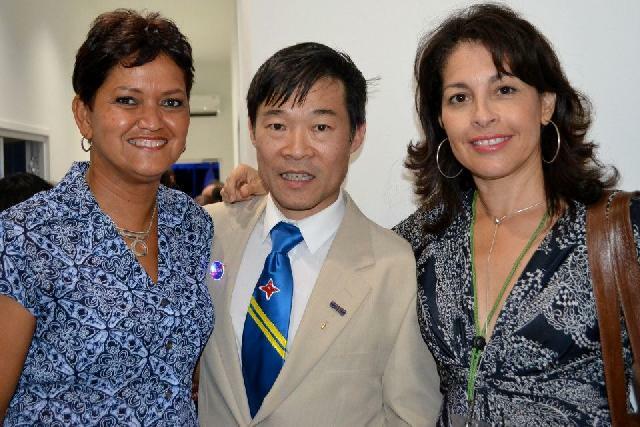 is Brigitte Avery de Meza (wife of the Minister of Energy, Utilities and Communication and prominent island physician), and on the right is Dilma Arends Geerman (network journalist). The Prime Minister is also a former classmate of mine. After the ceremonies, there was a party with one of the currently hot bands, which is "The Rincon Boys". They asked me on stage, and performed a special version of their hit song "Porfin tin un homber", changing some of the words slightly. speech by Prime Minister Mr. Mike Eman. Trifold printed for the opening. Page 1, Page 2. 24ora.com article on delegation from Brazil at the center. Archived. Diario article on sale of building. Archived. Second Diario article on sale of building. Archived. The conference organizers set the date of the event to coincide with the visit to Aruba of HRH Queen Beatrix of the Netherlands and her son, HRH Crown Prince Willem Alexander. The links above to various local paper also have articles on the Royal visit. At the conclusion of the second day, I was invited to the Governor's reception of the Queen, which took place at the Hyatt Hotel. This is the same hotel of our wedding. The reception was attended by the Queen and Prince, and also his wife Princess Maxima. There were only about 170 people invited to this, the only formal reception for the Royals. They arrived at about 8:45 pm, staying for one hour, and visited the tables separately. At the formal reception for the Royals. We were visited by Princess Maxima. We had the good fortune of being visited by Princess Maxima, who was very charming and friendly. This is consistent with the public opinion of her. I was told by many Royal watchers that she has increased the level of appreciation for the House of Orange. The Queen herself passed within two feet of me on her way to an art display, but neither she nor the Prince stopped at our table. We were under strict rules of behavior, which included no use of cell phones, nor cameras. After the departure of the Queen, we mingled and shot some images. On the far right is Jossy Brokke, who I grew up listening to. several CDs. I was very pleased to meet them. Over the next few days, the conference continued, and I received very positive feedback from the attendees about how Tisa and I ran the sessions and panels. On the final day, Prince Alexander delivered his keynote speech at the conference. The normal capacity of the lecture room was 350 people, and it was full the first day with the opening addresses. However, that was expanded to 500 for the Prince's address, and that filled up also. After the Prince's speech, we closed the conference, and bade farewell to all the conference goers. It was quite successful I think with a lot of networking going on, and an anticipation of what will be occurring next year. Elton Arends, Farra Jansen, Stijn Jansen (PM's chief of staff), me. Stijn is the tireless person that set up the GA2 conference. On my last night in Aruba for the week, I went to dinner with Mom and her closest friends, and on the way passed the Center. It is right along the main highway, and with the big blue facade lit up brightly can be seen by anyone driving by. It is an amazing feeling. View from my room at the Renaissance. Room 1556 on the fifth floor. I left for home on Sunday 10/30. It was an exciting and full week. I thank the people of Aruba for making it very special. 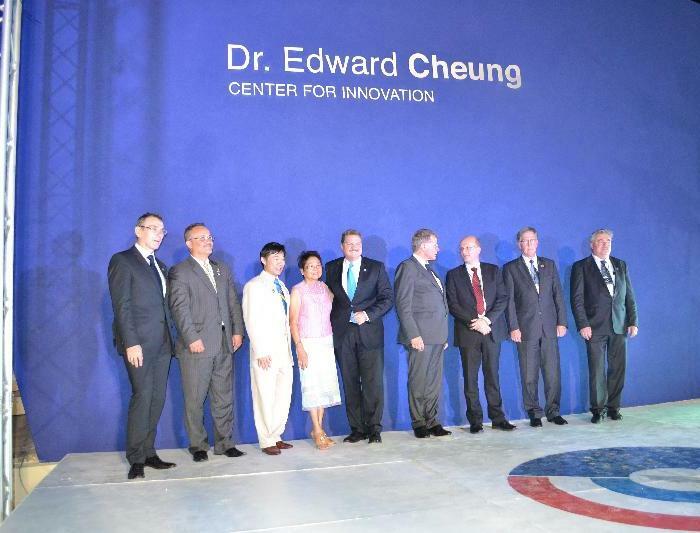 Seminar held at Innovation Center (January 2012). Archived. Agenda and Bios. Press Release. 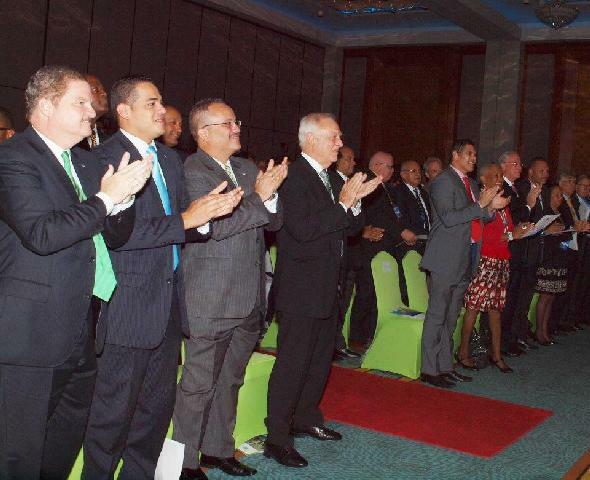 Comments from Prime Minister Eman on this seminar (in Papiamento). Archived. Link on Harvard University site. 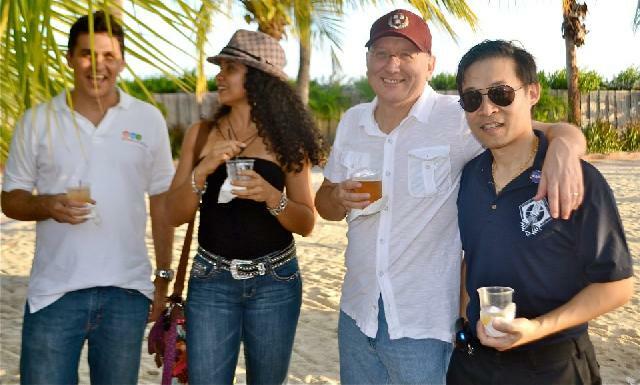 Summit to select a community in Aruba for the 'living lab' (2/12). 24ora.com (Papiamento). Cooperative agreement with TNO and University of Milan (4/12). Morningnews.com. Archived. 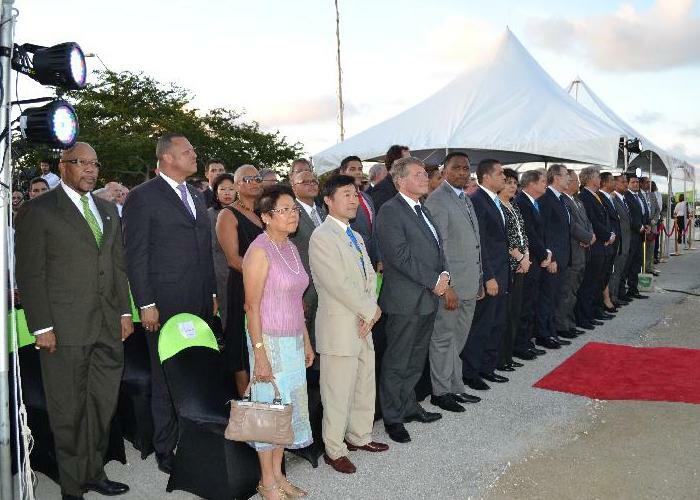 Meetings to discuss reopening of oil refinery in Aruba (5/12). 24ora.com. Hearing on second site for wind turbines (5/12). 24ora.com. First Symposium of the Netherlands Kingdom (6/12). 24ora.com. Follow up (Translation). Diario.aw. 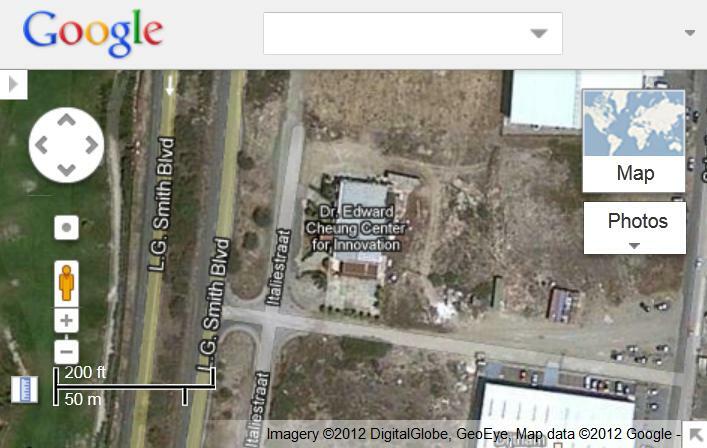 Innovation Center on Google Maps. Lecture by Arjan Erkel (8/12).